How is it the Dallas media come out with a piece like this one, one day before the anniversary of Kennedy’s murder? It’s a gauzy treatment of a bloody murder scene, papered over with handsome portraits of the couple from Camelot. You know you’re in Sixth Floor Museum land when you see these phrases: “lives changed forever,” “witnesses to history,” and “the tragedy of that day.” Why does Dallas not share indignation with the rest of the country about what happened there? First, no one from Dallas killed the president. His murderers travelled there to carry out the hit. Even Lee Oswald, the fall guy set up to take blame for the hit, was not from Dallas. The only gunman from Dallas was the clean-up man, Jack Ruby. Second, Dallas authorities – not Dallas residents, but Dallas authorities – participated in an immediate, thorough, and long-running cover-up of November 22’s events. That wasn’t true of everyone in Dallas’s law enforcement apparatus, but people with doubts knew enough to keep quiet. You don’t mess with LBJ, especially not when he’s president: the guy behind the homicide desk knows that. Third, the gauzy pieces make Dallas look complicit fifty-two years later. Pitifully, Dallas public relations people want the rest of the country to love them again, let assassination bygones be assassination bygones. Instead, they only win more disdain for their willingness to propagate the same old lies they participated in from the day sinister visitors from Washington executed their coup. Massachusetts’ post-action reviews and reports reflect the uneasiness Bostonians feel about seeing hordes of armed officers swarm around their city’s neighborhoods, forcing people to stay indoors – shelter in place, the governor called it – so they could open fire in Watertown or anywhere else they felt like spraying bullets around. Do you think police have become trigger happy? Look to their so-called training exercise after the marathon bombing to see how a police culture of abuse gets started. That’s enough about Boston. Dallas is an excellent case where some salty Texan indignation would be in order. At the time, most of Dallas welcomed the president. They recognized a good leader. The Dallas love people fifty years later want to emphasize that. It’s only a small part of the truth, though. The rest of the truth is that the nation’s premier intelligence agency brought in its criminal operatives to execute an elected president, then had the Federal Bureau of Investigation, the Secret Service, the Dallas police, and the Dallas district attorney cooperate in the cover-up and whitewash. How could that be? That could only happen in an atmosphere of compliance and submission, not an atmosphere of indignation and resistance. Why Dallas wants to promote such an unhealthy, false, lazy, romantic, and – let’s say it, delusional – atmosphere a half century later is beyond me. Dishonesty and craven public relations pieces won’t win the city any love in a country where, by the day, the secret government builds on the power it assumed on November 22, 1963. 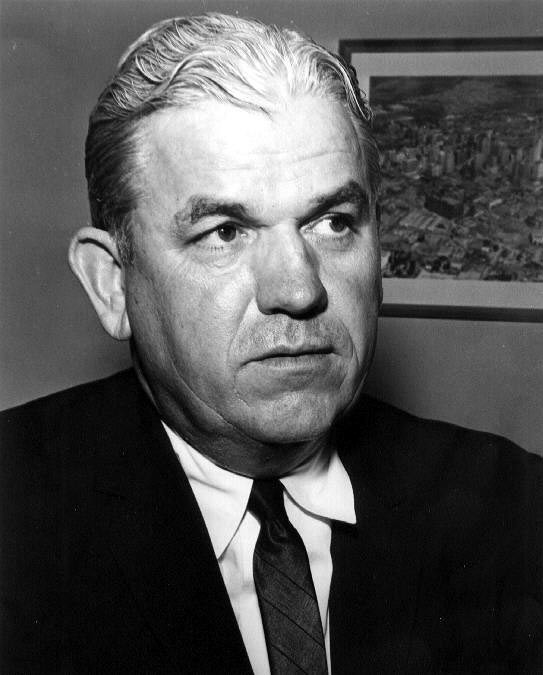 Henry Wade, Dallas County district attorney from 1951 to 1987. Suppose Jim Garrison had been able to secure cooperation from the Dallas district attorney when he opened his investigation of Kennedy’s murder three years later. You might ask, why did a district attorney hundreds of miles from Dallas have to take the lead in this matter? Why didn’t the Dallas district attorney, Henry Wade, approach Garrison to ask for his cooperation? Why didn’t Wade stand up to FBI Director Hoover on November 23, 1963? It didn’t happen because the Dallas district attorney was cowardly by comparison with his colleague in Louisiana. We don’t know what sort of pressure the FBI or others applied to the Dallas district attorney, but it worked. He decided that he didn’t care about the truth, and let perpetrators of the crime of the century, conducted in his own jurisdiction, go unpunished. Jim Garrison, New Orleans district attorney from 1961 to 1973. The same principle should have entered the reasoning of the Dallas district attorney: “When the clean-up people come after me because I try to discover the truth, make sure the cameras are running.” If authorities in Dallas had acted the way they should have acted, from the moment the coup took place, do you suppose they would be trying gin up some love with gauzy PR pieces now? Of course not. They would have had a solid moral foundation for leadership, and resistance to a secret state, that chose their city in central Texas as the site of a travesty, a crime so shocking the rest of the world wept while police in Dallas helped the real murderers cover their tracks. Here’s an appeal, fifty-two years later. Please, Dallas leaders, stand where you should have stood fifty-two years ago: with the truth. People all over the country will take heart, if they see Dallas’s leaders change the city’s tone for treatment of this public execution. Most city leaders were not born when Kennedy’s brains and gore spattered all over the presidential limousine, pavement, and police escorts behind him. If Oswald shot Kennedy from the sixth floor of the book depository, all that gore would have covered Governor Connally, immediately in front of President Kennedy. It would have travelled past Connally, to hit the secret service agent in the limousine’s front passenger seat. Some of it would have landed on the inside of the front windshield. Kennedy’s brains did not go toward the front of the car. The gore sprayed in the other direction. It sprayed toward the Lincoln Continental’s left rear tail light, where Jackie Kennedy climbed to recover a piece of her husband’s skull and brain tissue immediately after the fatal rifle shot. Lyndon Johnson made sure people equipped with buckets and sponges washed the president’s remains off the automobile’s trunk as soon as possible. A lot of people don’t even think about Kennedy’s murder anymore. It happened long before they were born. Other people think about it a lot, because they see its consequences so plainly today. That the perpetrators got away with the crime bothers them. The perpetrators whack a loyal but vulnerable asset like Oswald, publish a long report blessed by the nation’s chief justice, and they are done. That is not rough justice. The perpetrators go about their business, which is to run our country the way they want, without interference from an idealistic but tough president they don’t trust – a president that, from their point of view, posed a mortal danger to their country. They would not have planned the murder, then followed through, if their distaste and distrust had not reached such a high level. Yet indignation over this crime still feels subversive, forced underground, when the true subversion came from the perpetrators. You can still get tagged as a conspiracy nut, or buff, or theorist, or whatever derogatory label you choose, if you stick your head up and say the crime was a publicly executed coup. You can still find yourself dismissed if you say too much, or say the wrong things. To this day, the Central Intelligence Agency makes sure key evidence about Kennedy’s death is not published. That’s why leadership from Dallas could have a distinguishing effect. It could be a tipping point for the country’s desire for truth. Clearly people are fed up with lies, dishonesty, secrecy, betrayal, corruption, chicanery, cruelty, and practically every type of criminal behavior you can imagine on the part of the national government. Yet people – particularly in the mainstream media – remain afraid to talk or write about it. If Dallas, in the tradition of their independently minded state, were to take the lead in finding the truth about this crime, Washington would have a hard time dealing with an effort like that right now. It might tip the rest of the country into a wave of resistance the national government could not suppress. It would take some moral courage, but I expect that somewhere in Dallas, a man or woman of Jim Garrison’s character exists. Infamy: November 22, September 11, by T. J. Hill, published November 2015 by Puzzle Mountain.